In May we discussed the growing trend of businesses purchasing fake likes on social media and the problems it poses for those who choose to do so. Not only can a company lose credibility for a brand. It is also certain to miss realizing the biggest benefit of what makes social media marketing so valuable: fan engagement. While phony fans may be somewhat difficult to determine on platforms such as Facebook and Instagram, Twitter makes it much easier to flesh out the fakes. There are several tools available that will allow you to analyze the breakdown of the following for any Twitter account. 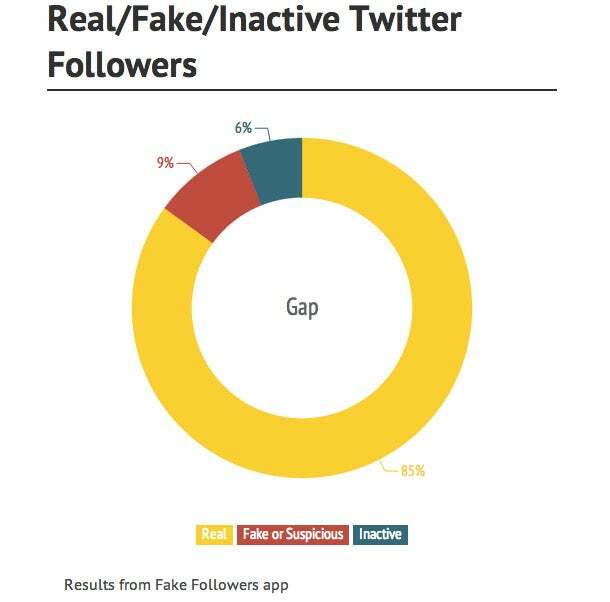 Fake Followers, Fake Follower Check and Twitter Audit are just a few of the increasingly popular applications someone can use to gauge just how genuine are a company's Twitter followers. While many now know celebrities, athletes and even some politicians puff up their online presence by paying for followers, little is known or spoken about what big businesses are up to. 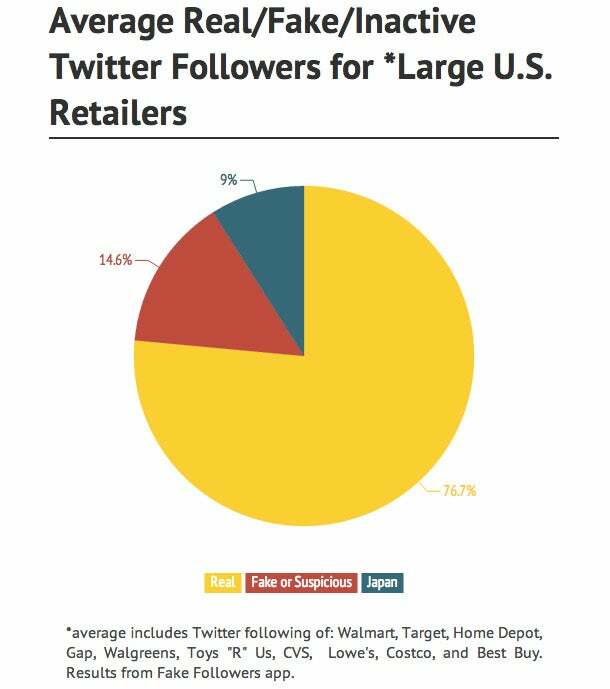 To add some details about how legitimate some of these massive audiences are, we conducted an audit July 16 using the Fake Followers app of the Twitter followings for 10 of the largest U.S. retailers: Wal-Mart, Home Depot, Target, Walgreens, Gap, Toys "R" Us, Best Buy, Lowe's, CVS and Costco. Knowing how aggressive, competitive and image obsessed businesses such as these can be, the results may surprise you. 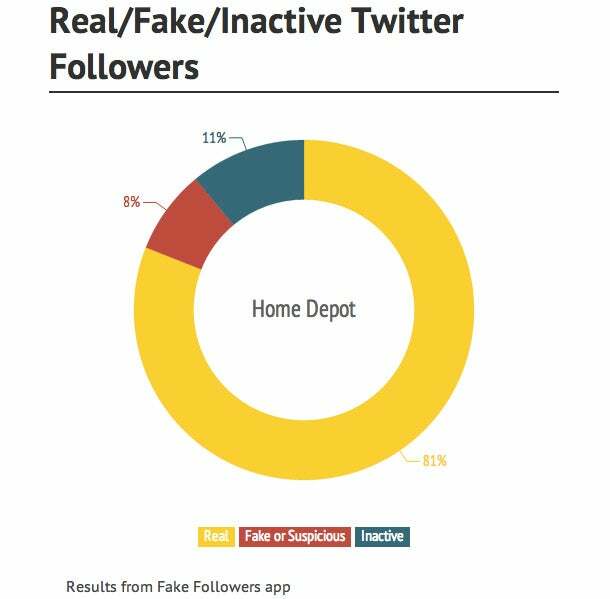 While expecting to uncover a high percentage of fake followers for this group, we were surprised to learn that on average more than 74 percent of their followers are real and just 16 percent fake (with 9 percent inactive). Target scored the highest with more than 86 percent of its following appearing to be legititmate. Most of the companies included in this exercise had similar results. On the flip side, Toys R Us was the lone outlier in terms of fakes, with close to 29 percent being flagged as such. Before we shame anyone, however, we will point out that not all fake Twitter accounts are purchased. Not only can spammers follow these corporate accounts without a company's knowledge, it's possible incomplete follower profiles are being flagged as fakes. Overall, the results were encouraging. Perhaps these big companies have learned what celebrities have yet to figure out. The true power of social media is best realized when a company adopts a quality-versus-quantity approach to its audience. While having a seemingly inordinate number of followers on any platform may look impressive, genuine engagement and interaction allow for establishing and deepening quality relationships with customers and prospects. Even just a few genuine and loyal fans are far more powerful than thousands of manufactured followers. It's impossible to leverage the love a customer has for a brand if they don’t exist. Quality engagement on social media, even with just a handful of potential brand advocates, is what will allow these businesses to achieve incremental success. It’s encouraging to see that companies are starting to figure this out. The question is, Has your company? Editor's Note: This article and infographic have been updated. 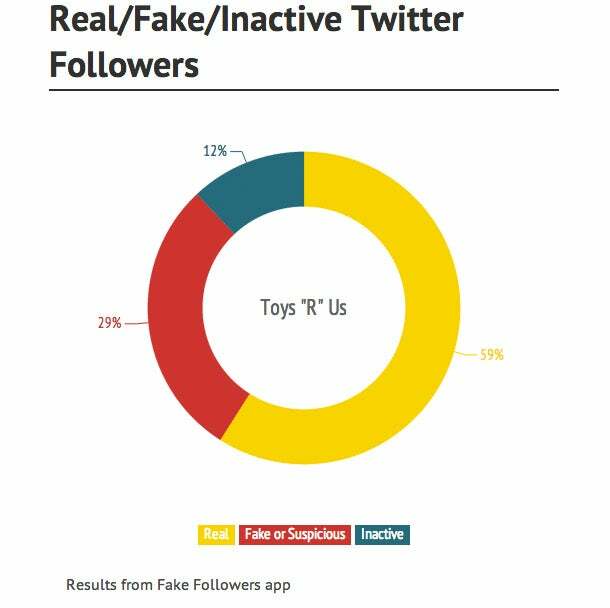 The previous version incorrectly cited the percentages of followers for Gap and Toys R Us and referenced a different app. The app that was used is called Fake Followers.